Thomas F. George served as chancellor and professor of chemistry and physics at the University of Missouri–St. Louis from 2003 until his retirement in 2019. As chancellor, he oversaw academic and administrative operations of a university with 17,000 students, 2,500 faculty and staff, 40 academic buildings and a $200 million annual operating budget. In addition, $150 million of new capital construction, renovation and landscaping on campus took place during 2015-17. The annual amount of philanthropic contributions during his tenure as chancellor quadrupled to over $27 million, reaching as high as $31 million in 2014. Chancellor George was active in the St. Louis community. He received the Distinguished Higher Education Award from the Dr. Martin Luther King, Jr., Missouri State Celebration Commission; the Outstanding Community Service Award from the St. Louis County Branch of the National Association for the Advancement of Colored People; the Lifelong Vision Award from the Lifelong Vision Foundation of St. Louis; the Distinguished Eagle Scout Award from the National Eagle Scout Association; and the Silver Beaver Award, Good Scout Award, Cosmos Award and Alumnus of the Year Award from the Greater St. Louis Area Council of the Boy Scouts of America. Specifically with respect to St. Louis North County, he was named the Chamber of Commerce Citizen of the Year, and he received the Outstanding Leadership Award from the North County Churches Uniting for Racial Harmony and Justice, the Paul F. Detrick Legacy Leadership Award from the Christian Hospital Foundation Board, and the Public Service Leadership Award from North County Inc. He served on numerous civic boards, including nine years as chair of the Higher Education Consortium of Metropolitan St. Louis and four years as chair of the Great Lakes Valley Conference (athletics). In addition to his role as campus and community leader and fund-raiser, Chancellor George contributed at the state and national levels, such as serving as vice-chair of the Council on Public Higher Education in Missouri and as president of the Coalition of Metropolitan and Urban Universities (comprised of 100 institutions across the US and Canada). An active researcher in chemistry and physics, Chancellor George specializes in chemical/materials/laser/nanophysics, including nanomedicine. His work, supported by a wide variety of federal and international agencies, has led to nearly 800 papers, 7 authored and 18 edited books, and 235 conference abstracts. 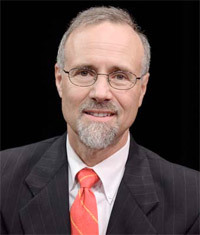 He has been recognized nationally and worldwide, such as being awarded the Marlow Medal by the Royal Society of Chemistry in Great Britain and named a fellow in various professional organizations (New York Academy of Sciences, American Physical Society, Society of Photo-Optical Instrumentation Engineers, American Association for the Advancement of Science) and foundations (Dreyfus, Sloan, Guggenheim). He has been elected as a foreign member of the Korean Academy of Science and Technology, and he has held the title of visiting professor in the College of Science at Korea University in Seoul. His research has been acknowledged by an honorary doctorate in physics (honoris causa) from the University of Szeged in Hungary. He also has received an honorary doctorate in education for locality development from Phranakhon Rajabhat University in Thailand. He has been awarded the Medal of Honor from Gulf University for Science and Technology in Kuwait and the Diploma of Honour from Seinäjoki University of Applied Sciences in Finland. An accomplished jazz pianist, Dr. George studied with faculty at the Berklee College of Music in Boston and the Eastman School of Music in Rochester, New York. He has performed extensively in public, including performances at various venues in Missouri and Illinois, the University of Arkansas, Gettysburg College in Pennsylvania, Nanjing University and Northwestern Polytechnical University in China, city of Szeged in Hungary, West University of Timisoara in Romania, Gulf University for Science and Technology in Kuwait, University of Sarajevo in Bosnia, University of Dubrovnik in Croatia, the Cultural Club in Muscat, Oman, and Russian Siberia. Born in Philadelphia, Chancellor George became an Eagle Scout at age 14 (with bronze/gold/silver palms and Order of the Arrow) and received his high school diploma from Friends' Central School, where he earned varsity letters in soccer and wrestling. He received a bachelor of arts degree (Phi Beta Kappa) with a double major in chemistry and mathematics from Gettysburg College in Pennsylvania. He earned a master of science degree and doctor of philosophy degree in theoretical chemistry from Yale University at age 23, followed by postdoctoral appointments at MIT and UC Berkeley. Joining the faculty at the University of Rochester, he was promoted by age 29 to full professor of chemistry. He then served as dean of natural sciences and mathematics at SUNY–Buffalo, provost at Washington State University, chancellor at the University of Wisconsin–Stevens Point, and since 2003 as chancellor at the University of Missouri–St. Louis. Dr. George has been married since 1970 to Dr. Barbara Harbach, who served as Curators’ Distinguished Professor of Music, chair of the Department of Music, director of the School of Fine and Performing Arts, and director of Women in the Arts at the University of Missouri-St. Louis. She prior academic appointments at the University of Wisconsin-Stevens Point, University of Wisconsin-Oshkosh, Washington State Universit8y and SUNY-Buffalo. They are the proud owners (actually, servants) of four cats – two tortoise females (Luna and Stella) and two younger, mischievous males (Jeremiah and Jarrett).